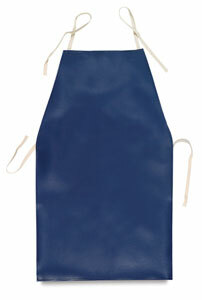 These aprons are designed for older children, ages 8 to 14. They're made of quality, cloth-backed vinyl or blue denim with fully adjustable stitched-on ties. Aprons measure 17" wide × 29" long (43 cm × 74 cm).